The president of Jacksonville City Council on Monday asked several city departments conduct an inventory of all Confederate monuments, memorials and markers on public property with the intention of asking that they be removed. "At the end of the day, I’d like to move them," President Anna Lopez-Brosche said. "I’d like to make sure that we can appreciate the history and heritage of what these memorials, monuments and markers mean to city of Jacksonville. At the same time, also realize that these are symbols that evoke a significant amount of negative emotion for some in our community." Brosche said her action comes after the "horrific and unacceptable incidents" that occurred in Charlottesville, Virginia, and follows the actions of Florida Gov. Jeb Bush and, most recently, the Florida Senate, who removed Confederate items from public places in Tallahassee. She directed the Parks and Recreation Department and planning division's Historic Preservation Section to inventory of all Confederate monuments, memorials and markers on public property. "Upon completion of the inventory, I intend to propose legislation to move Confederate monuments, memorials, and markers from public property to museums and educational institutions, where they can be respectfully preserved and historically contextualized," Brosche said in a statement announcing her plan. "It is important to never forget the history of our great city; and, these monuments, memorials and markers represent a time in our history that caused pain to so many." Mayor Lenny Curry said Monday that the Virginia tragedy was awful and he respects the City Council's role in making law. If Council passes a bill removing the statues, he will review it and decide whether he will sign it. "I respect the Council’s role in moving forward with priorities that are their priorities that may not be mine," Curry said. "Look, you can’t be all things to all people. And I’m very focused on a city that’s fighting its way out of violence because public safety was gutted." Monument to Women of the Confederacy is a bronze sculpture of a mother with two children inside a 47-foot-tall granite rotunda in the city's Confederate Park. On the top is a second figure of a young woman clasping a half-furled Confederate flag. Confederate Soldiers Memorial, a 62-foot granite shaft in Hemming Park topped by a Confederate soldier at rest. A bronze plaque at the base honors Gens. J.J. Dickinson, Kirby Smith, Robert E. Lee and Stonewall Jackson. Camp Capt. Mooney Cemetery on Ellis Road South at Harold Avenue contains five Confederate graves owned by the United Daughters of the Confederacy. It sits on the site where Confederate soldiers were killed by 500 at at the Battle of Olustee in 1864. More than 250 Confederate veterans are buried in Old City Cemetery, on East Union and Cemetery streets. Many of those were from the Old Confederate Soldiers and Sailors Home opened in Jacksonville in 1893 to care for aging and disabled veterans. Yellow Bluff Fort, was built in 1862 as part of the Confederate defense of Jacksonville, is now a state park on New Berline Road. In 1950, the United Daughters of the Confederacy erected a monument there to "Confederate defenders of Jacksonville." Community efforts to have the Confederate soldier marker in Hemming Park removed, as well as similar statutes removed and Confederate Park renamed have been gathering momentum. After Saturday's deadly violence where a car was driven into a group of people protesting a white supremacist rally in defense of a statue of Gen. Robert E. Lee on Charlottesville property, Take 'Em Down Jax held an emergency rally that night outside the Jacksonville Landing. “This hate, we have to confront it. If we don’t, it won't go away," Wells Todd said, a member of Take 'Em Down Jax, told News4Jax earlier this summer. Lakey Love, with the American Civil Liberties Union, agrees that the monuments should be gone. "I stand for taking them down. They represent white supremacy, a history of racism -- internment of black and brown people," Love said. "I’m all for taking down anything that represents a historical path that marginalizes people." There are also people in Jacksonville who oppose moving the statues. "And even though we might not agree with what has happened in the past, I think it’s still part of history and we should not destroy it," said Brian Buschow said. Dave Nelson, who sells Confederate historical memorabilia at his store, Uncle Davey’s Americana, supports the historical markers, but not the white nationalists who are linking themselves to Confederate history. "As far as removing the monuments, that’s very sad because these are monuments to veterans or Confederate soldiers. The U.S. Congress said that all veterans are U.S. veterans," Nelson said. Because most of these monuments are well over 100 years old, some, including Councilman Jim Love, have speculated that they can't be moved without breaking them. Some other Florida cities have either removed Confederate markers or are in the process of doing so. Work removing "Old Joe" from outside the Alachua County Administration building in Gainesville began Sunday and continued Monday. 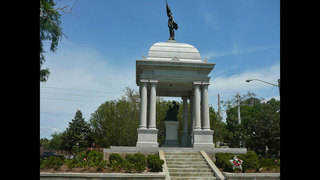 The statue is being returned to the local chapter of the United Daughters of the Confederacy, which erected it in 1904. The County officials said they did not know where the statue would go, the Gainesville Sun reported. In June, the city of Orlando removed a statue depicts Johnny Reb -- a symbol of the Confederacy and its soldiers -- from Lake Eola Park. The statue was moved to Greenwood Cemetery, where it will be kept in a section dedicated to Confederate veterans. In Tampa, a passer-by called 911 after seeing that paint had been tossed on and around the Confederate memorial's columns and derogatory comments were scrawled in paint, the Hillsborough County Sheriff's Office said in a news release. The site is on private property near Tampa on Florida's west coast. Hillsborough County commissioners voted on July 19 to remove a different monument in the county, this one in downtown Tampa and on county property, after several heated meetings filled with public discussion. The 60-foot-tall granite column, topped by a bronze statue of a Confederate soldier, has been in Jacksonville's Hemming Plaza for nearly 120 years. It’s the site of a monument to Women of the Confederacy that was dedicated in 1915 and a historical marker placed by the Sons of Confederate Veterans to commemorate the May 1914 national reunion of Confederate veterans that took place in Jacksonville. In March, the Jacksonville City Council Neighborhoods Committee asked the full council to withdraw a bill to designate Hemming Park’s confederate monument as a historical landmark. Others markers in parks and public areas around the city include a tribute to the women of the Confederacy in Confederate Park and the Gen. Joseph Finnegan grave monument in Jacksonville's Old City Cemetery.